"Pronounced dhroz-djoo-vka, is a typical Polish yeast cake, usually enjoyed on Sunday afternoon with a cup of tea or coffee. Different variations of it are also being eaten during Christmas and Easter. This is the first ever cake I managed to successfully bake (at the age of 13) and since then I have been baking it for my friends in various spots around the world, including Negev Desert in Israel where I used solar oven (6 hours baking time)." In a saucepan over very low heat, warm up 1/2 cup of milk to no more than 100 degrees F (38 degrees C); stir in 1 tablespoon of flour and 1 tablespoon of sugar. Remove from heat and transfer to a bowl. Crumble the cake yeast into the milk mixture, and gently stir until the mixture becomes creamy. Cover the pan with a cloth, and set aside in a warm place until the yeast forms a spongy texture, 20 to 30 minutes. Melt margarine in a saucepan over low heat; remove from heat and allow to cool to lukewarm. Preheat oven to 350 degrees F (175 degrees C). Grease a 9x13-inch baking dish, and sprinkle with bread crumbs. Place eggs and 1 1/8 cup sugar into a blender, and process until the mixture is yellow and fluffy. In a large mixing bowl, whisk together 8 cups of flour with vanilla sugar. Stir in the egg mixture, activated yeast mixture, and lukewarm margarine; start kneading 1 cup milk, or as needed, into the dough, a little at a time, until the dough stops sticking to your fingers and becomes smooth and even. Knead for at least 15 minutes, working to incorporate as much air as possible into the dough as you knead. Press the dough evenly into the prepared baking sheet, and arrange the plums over the top of the dough. Set aside. 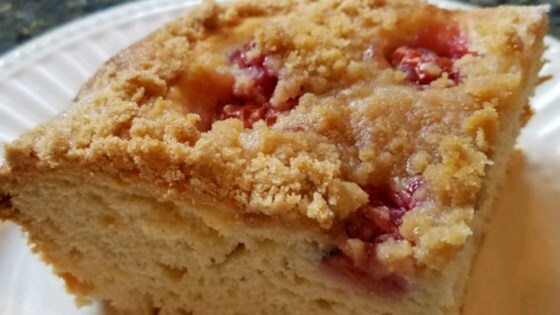 In a bowl, cut together 1 1/2 cup flour, the butter, and 1/2 cup of sugar with a pastry cutter until the mixture resembles fine crumbs; sprinkle the streusel mixture over the plums. Dust streusel with cinnamon, if desired. Bake in the preheated oven until a toothpick inserted into the center of the cake comes out clean, 1 hour to 1 hour and 10 minutes. A simple white cake with magical custard filling! Original recipe makes an 11x13-inch cake or 2 loaves. Use plain white flour, type 450 if you have it--or Maka Tortowa if you happen to have a Polish grocery nearby! We have corrected the yeast amount to two (0.6-ounce) cakes of fresh yeast. The cooks notes says the original recipe makes an 11x13 cake. I believe this is a misprint. Even at 11x15, there is more cake than others of this style. I use a 12x18 sheet cake pan.